For whatever reason, musical talent often runs in families. Look at Lady Hallè, who was born into a family of prodigies – or the sisters Teresa and Maria Milanollo – or, nowadays, siblings Scott and Lara St. John. The Eissler sisters were two prominent Victorian sibling musicians. Clara was a harpist and Marianne a violinist. Here is a short excerpt from an article entitled “Moments with Modern Musicians” by F. Klickmann that appeared in early 1896 in The Windsor Magazine. …Our final moments are to be spent with those two clever musicians the Misses Eissler. Like Herr Stavenhagen they are not natives of our foggy land, but unlike him they have made a permanent home with us. This is the more singular seeing that both the sisters hold official appointments at a foreign Court, Miss Clara Eissler being Court Harpist and Miss Marianne Eissler Court Violinist to the Duke of Saxe-Coburg Gotha. When State functions require their attendance, the sisters take a journey abroad to fulfil their engagements, after which they return to their home in Redcliffe Square. This Misses Eissler are natives of Brünn, Moravia – a town already famous in the annals of violinists. Ernst was born there, also Wilhelmina Neruda (now Lady Hallé) and her brother Franz Neruda, the ‘cellist. Herr Eissler was a professor of science at the Brünn University. On his death however Madame Eissler removed to Vienna, in order that her daughters might have greater musical advantages than was possible in Brünn. “How was it that you made the harp your specialty?” I inquired of Miss Clara Eissler, after examining the exquisite instrument that had been made for her by Messrs. Erard. “Seven years old seems very young to enter a Conservatoire,” I remarked. Our conversation was interrupted by the appearance of the young violinist herself, who had just returned from fulfilling an engagement at an afternoon concert. At my request she exhibited her beautiful “Carlo Bergonzi” violin, which bears the date 1732. 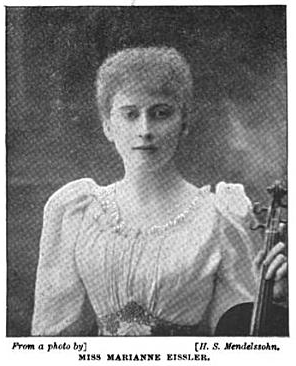 This violin cost £400, and was presented to her by her friends in London. Violin collecting is a pardonable weakness in which Miss Marianne Eissler indulges; her partiality for autographs is a less expensive pursuit, however. 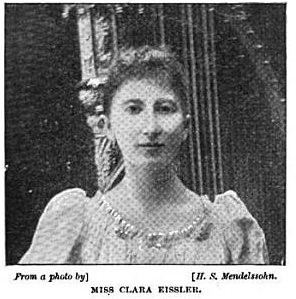 Miss Clara Eissler – who has a most artistic eye for such matters – finds her chief delight in arranging furniture and generally beautifying the home, while her favourite pastime is playing billiards. The sisters have the highest regard for the musical ability of our royal family. “I have heard that her Majesty takes a great interest in the music that is performed before her,” I said. Our musical chat was finally broken up by Tristan – a terrier belonging to the harpist – who noisily demanded to be admitted to his mistress’s domain without further delay. The rest of our time we employed in trying to induce that quadruped to perform certain tricks in view of a prospective piece of sugar. But he was a superior dog and declined to sell his genius to so base an end – though he ultimately ate the sugar with little compunction.